A seemingly normal afternoon turns into an apocalyptic day when one tiny toad gains the ability to grow more and more with each thing he eats..
Now he is on a quest to consume the entire universe! Only time will tell what he will become..
ever wanted to see how big a toad can get? Now you can. Start out as a tiny toad and watch him grow, mutate, and evolve into different forms, ranging from the strange, hideous, and ultimately wondrous. What does a human taste like? Would a nuclear missile give you heartburn? Put toad to the test and see if he's up to the challenge. It's a veritable smorgasbord with over 40 different enemies to devour. It's finger clicking good! TOAD HUNGRY! coins, coins, and more coins! Click your fingers off as you collect coins to upgrade your toad's abilities and health. Become the ULTIMATE TOAD. 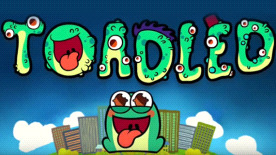 earn 25 achievements in the game along with toadly badass badges and trading cards. there can only be one toad. Compete with players on the Toadled leaderboards to see who has the fastest tongue in the world.